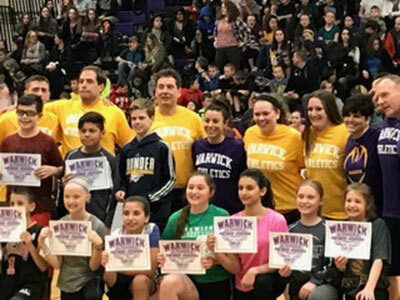 The annual UltaMania faculty basketball game, held on Friday, March 3 in the Warwick HS Gymnasium, was a huge success. Over $4000 was collected to support Warwick Lion’s Club projects and Warwick Valley Teachers Association Scholarships. The game was won by the High School faculty 58-55, and leading scorers were WVHS Principal, Dr. Larry Washington and WVMS Psychologist, Deb Girardi. Proceeds from the concession stand were donated by the high school Phys. Ed. staff to upgrade the HS Fitness Center. Natalie Evans, Erin Smith, Christie Sass, Molly McCleary, Julia Singh and Lily Bailey.